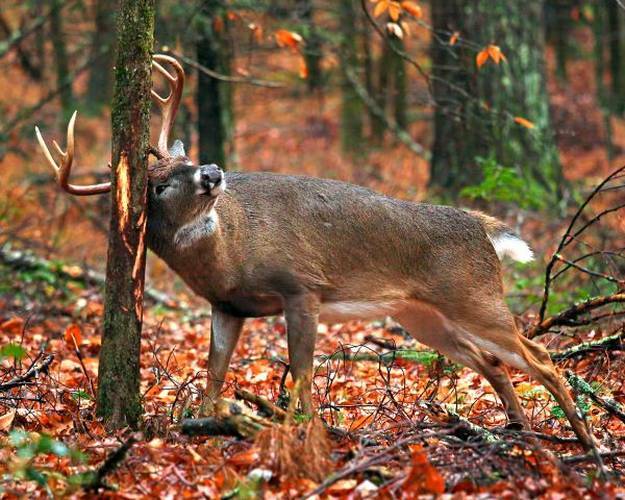 Whitetail deer in the North Woods marking his territory. The land along the Huron River which became Ypsilanti, Michigan was surrounded by a vast stretch of primeval forest broken only by lakes, marshland, and occasional open tracts of land early settlers called “oak openings.” The ground cover was a tangle of rugged shrubbery blanketed by a deep carpet of fallen leaves decomposing into rich soil the region became known for. Herds of deer and solitary black bears roamed the countryside while smaller game lived in the treetops and along the river banks. Fish, crawdads, and snapping turtles plied the river currents. The open area where the Huron River bends and narrows at the shallows was a crossroad and neutral ground for the Chippewa, Pottawatomie, Ottawa, and Wyandot (Huron) Native Americans. 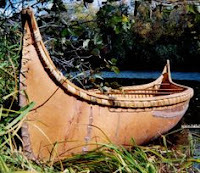 The area was not a permanent home of any particular tribe, but the Hurons--as the French dubbed them--were known to have a burial ground on the west side of the Huron River. There were only two ways to enter the area: by river in a canoe or by foot on the Pottawatomie Trail, which followed the Huron River Valley from the headwaters of Lake Erie. This ancient Indian pathway led to the heartland avoiding most terrain and water impediments. 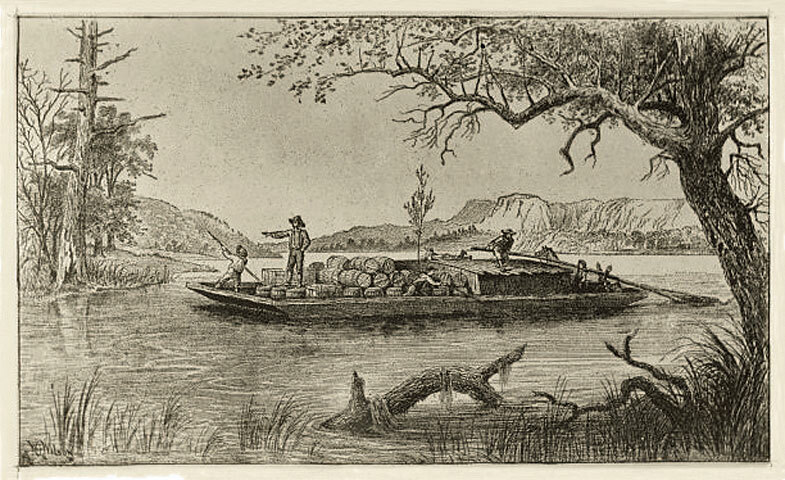 In 1809, three French pioneers Gabriel Godfroy, Francois Pepin, and Romaine La Cambre built and operated an Indian trading post named Godfroy’s on the Pottawatomie. Various tribes traveled east and west at the Huron River crossing. The trading post bartered gaudy trinkets, steel knives, hand-held farm implements, and small kegs of whiskey for beaver, muskrat, bear, deer, fox, and otter pelts. Native American handicrafts were also traded for American goods brought in from Detroit by pack horse on the Pottawatomie Trail. Two years later, the three Frenchmen, and Godfroy's adult children were issued four tracts of land under the seal of President James Madison known as the original French Claims. Each claim was approximately a half mile wide and two miles long with the Huron River as its eastern boundary. The four claims included two square miles or about 2,500 acres. The trading post burned down in 1815 but was quickly rebuilt. In 1819, Native Americans began moving westward as European civilization encroached. With the conclusion of the Treaty of Paris, Lower Michigan fell out of Native American hands forever. By 1820, the trading post was abandoned and left in ruins. 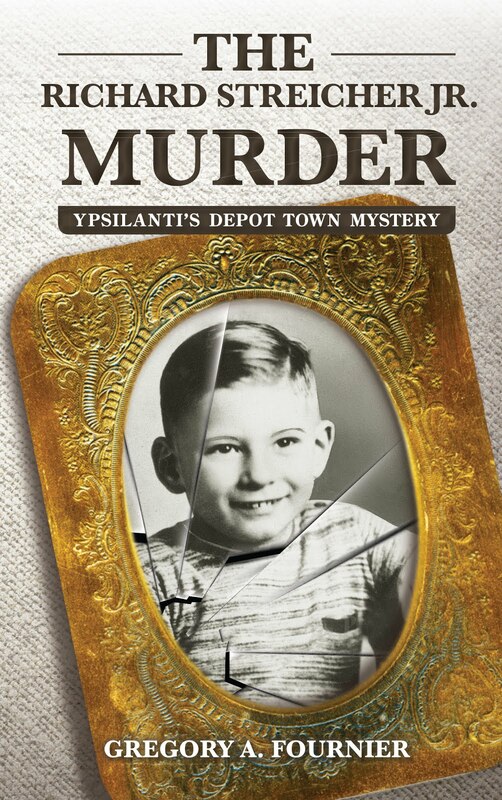 Meanwhile in Sandusky, Ohio, Benjamin Woodruff’s wife Ella inherited several hundred dollars from her grandfather’s estate. She and her husband decided to invest the windfall where land was cheap--that was Michigan Territory. In the spring of 1823, Benjamin Woodruff, his brother-in-law William Eiclor, Oronte Grant, and Hiram Tuttle decided to improve their lot and set out on the old Indian trail at Lake Erie in search of land to homestead. The group was outfitted with a wagon loaded with provisions and a large number of cattle belonging to Grant and Tuttle. Each of the men had a stake in the success of this venture. The group lodged with former neighbors from Sandusky, who then lived in Monroe, Michigan. They were familiar with the countryside of Southern Michigan and suggested a clearing near the ruins of Godfroy’s on the Pottawatomie as a favorable location for a settlement. The pioneers sold much of their cattle to finance their enterprise but retained enough livestock for their new farms. 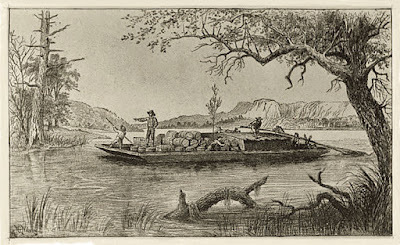 They headed into the interior of Michigan Territory, first on a flat-bottomed boat powered by poles the men used to power their cargo upstream. Where the waterway narrowed and the current was too strong, the men offloaded their wagon, repacked their supplies, and continued west on foot. A couple of days later, the party came upon a suitable stretch of land southeast of the old trading post. The open plain there would be easy to cultivate. The men staked their claims which would soon become their homes hewed out from trees cleared from the land. 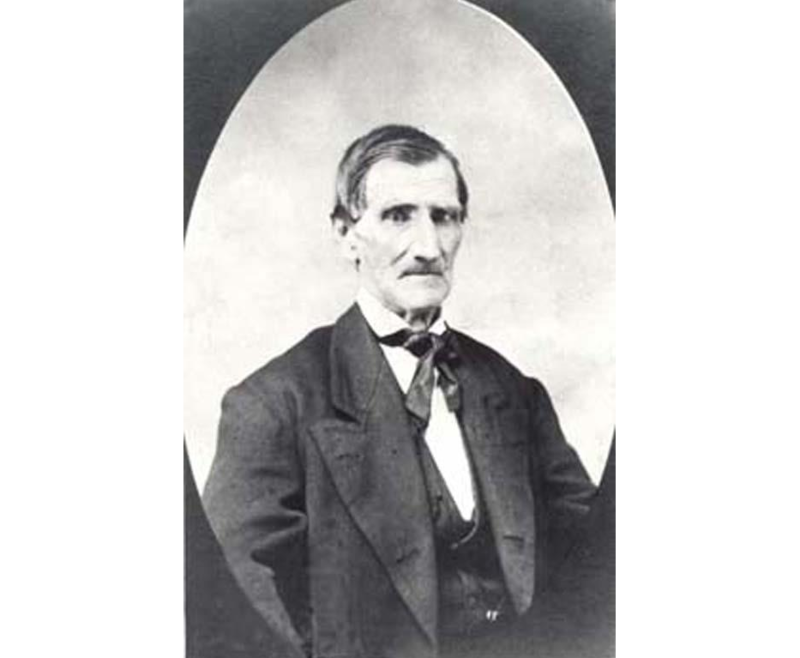 Benjamin Woodruff left Hiram Tuttle in charge of the settlement while he returned to Ohio to bring his family and more supplies to their new home. Woodruff with his wife and six children arrived back on July 6th. When news of the new settlement reached Detroit, other people ventured west and were welcomed by the original settlers who envisioned a pioneer metropolis. The newcomers built log cabin frontier homes and cleared and fenced off more farmland. The settlement became known as Woodruff’s Grove. 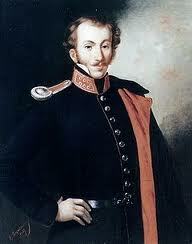 The first crisis hit the new community in August of 1824. Malaria struck many of the settlers. If it wasn’t for the efforts of Ella Woodruff and Elona Rogers making hot porridge every day and taking it to the afflicted, many settlers would have perished. All but one settler survived. Fall and winter were times of hardship for the settlement. Supplies had all but run out and money was scarce. But the first corn harvest was good and household gardens yielded plenty of turnips, beans, and potatoes. Venison, small game, and fish provided protein to round out their diet that winter. The spring of 1825 brought more settlers who cleared and fenced off more land. Wildlife began avoiding the area. That same year, the Territorial Government of Michigan proposed a road be cut through the wilderness to link Detroit and Chicago—the two emerging centers of Great Lakes trade. It was argued that building the road would create a commercial and real estate boom along the road stretching the width of the Michigan territory. The road would also allow the Michigan militia to move supplies and manpower quickly to Chicago if necessary. Surveyor Orange Risdon was commissioned to lay out a practical route in 1825 and was surprised to find how easy the task was by following the well-worn Pottawatomie Trail through the Huron Valley to the old Sauk Trail west. Much to the dismay of the settlers, the survey team bypassed Woodruff’s Grove by three-quarters of a mile north. The distance was not much as the crow flies, but it was enough to destroy the dream of a pioneer metropolis. The small settlement was abandoned and fell into ruin. Soon after the new Chicago Road was surveyed, land developers arrived. Judge Augustus Woodward and his business partners—John Stewart and William Harwood—bought the original French Claims on the Huron River. They platted the land into affordable real estate parcels. They christened their new town Ypsilanti after a Greek general prominent in the news of the day. Shortly after, a frontier town developed. In 1830, Ypsilanti’s first post office was constructed with regular stage and mail service to Detroit instituted. In 1832, the Michigan legislature officially recognized the frontier town as the Village of Ypsilanti. The wilderness had been tamed. 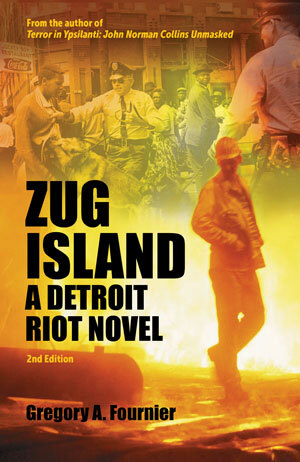 As 2017 was coming to a close, I thought Terror In Ypsilanti: John Norman Collins Unmasked and Zug Island: A Detroit Riot Novel were all but played out. 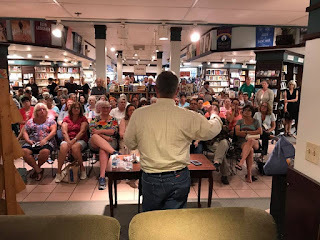 I began the year with several California and Arizona book talks which were sparsely attended. Fortunately, my books were selling with some regularity on Amazon, and Ebook sales kicked-in to carry the day. 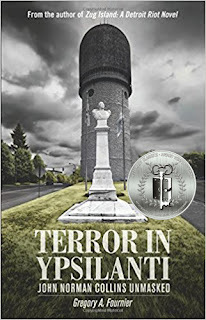 In February, I was approached by Tantor Media in Australia for the audio rights to Terror In Ypsilanti. They produced, advertised, and distributed the audio. All I had to do was cash the $500 advance and forget about it. Advances are guaranteed upfront, but royalties don't begin until profits pay back the advance. I thought it would take forever if at all, but I started earning royalties in the third-quarter. That was an unexpected surprise. The audio was selling. Terror In Ypsilanti and Zug Island are self-published regional stories. Several editors and agents told me there was no audience for them. In April, I did a limited book tour in Ypsilanti, Ann Arbor, and Detroit, Michigan and was surprised when I sold out my stockpile of books. I returned again in July with more books to sell at Bookclub of Detroit's Bookfest. I sold out again. Traveling to Michigan from California to promote my books eats up my profits, but I didn't want the titles to die on the vine. Money has never been a motive for writing my books. 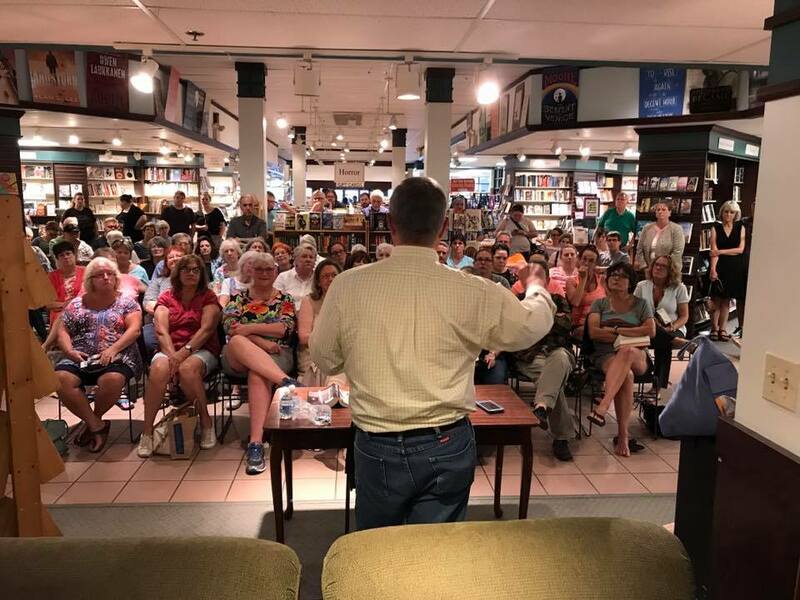 To get regional bookstores to handle Terror In Ypsilanti, I stripped my profit out of the equation to make the book attractive to booksellers. 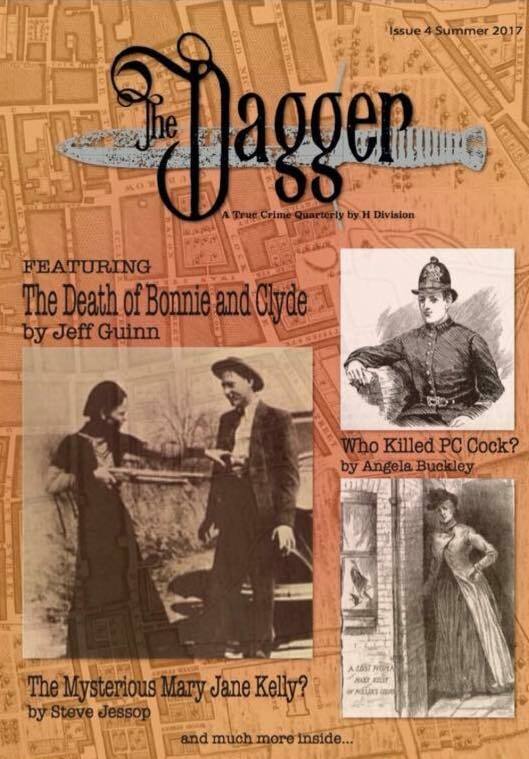 Aunt Agatha's Mystery Bookstore, Nicola's Books, and Barnes & Noble in Ann Arbor agreed to carry my title. The Barnes & Noble in Allen Park--my hometown--also decided to carry the book. There may be others I'm unaware of. 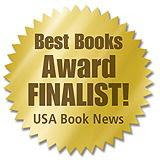 All bookstores are welcome to contact my publisher Wheatmark, Inc. for more information. Word of mouth has given Terror In Ypsilanti a life of its own. 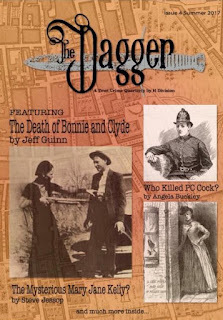 Last spring, I wrote an article about John Norman Collins for The Dagger magazine in London. Months passed and I forgot about it. Early in December, I was notified that the article was published in their quarterly winter edition. This gives my book some international exposure. A day or two later, a CBS producer contacted me to see if I'd be interested in being interviewed about the Collins murders for Through the Decades with Bill Kurtis in March. Talk about unexpected! 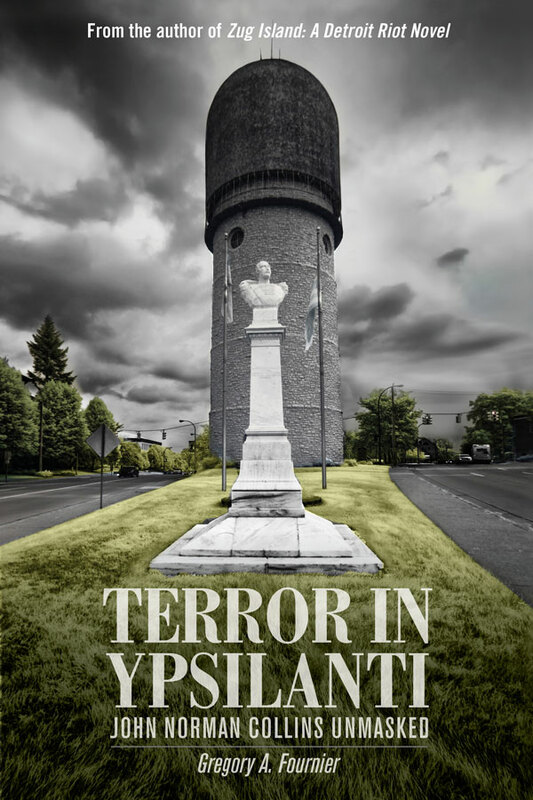 The program will give Terror In Ypsilanti some much needed national exposure when it airs in August. What a nice way to end the year. 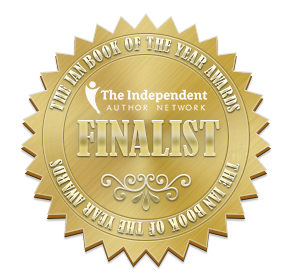 Without my Fornology blog posts, I wouldn't have been able to get word out to the public or the media at large about my books. In April 2011, I reluctantly started blogging at the request of my San Diego publicist Paula Margulies. My inner voice told me, "Who the Hell has time for this?" Once I got my posting rhythm down, I found I actually enjoyed blogging and the instant gratification I got from it. More and more people discovered my site and responded positively. I was not only building a domestic audience, but also getting some international exposure from Russia, Germany, Ukraine, Canada, the United Kingdom, and a vast array of other countries. In the six years since I began blogging, I've written over 380 posts. On December 26th, Fornology.com surpassed half a million hits. In 1957, Universal Pictures syndicated a television package of fifty-two classic horror movies released by Screen Gems called Shock Theatre. The package included the original Dracula, Frankenstein, Mummy, and Wolfman movies. 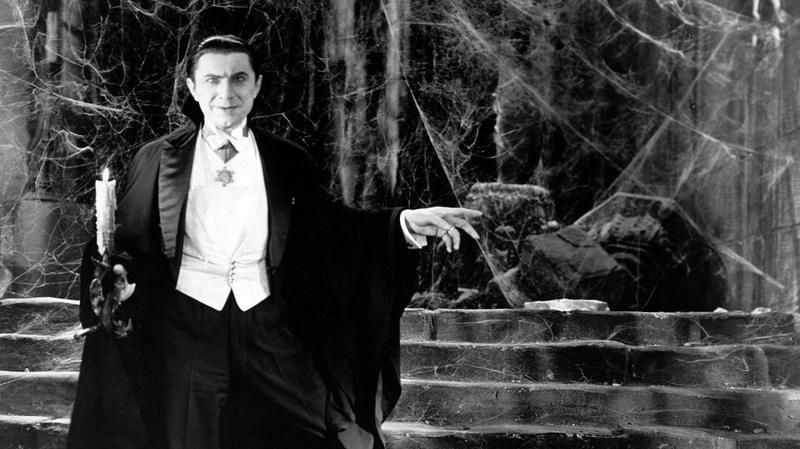 Shock Theatre premiered with Lugosi's Dracula in Detroit on WXYZ channel seven at 11:30 pm on February 7, 1958. Each syndicated television market had their own host. 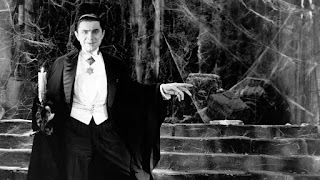 Detroit had one of the first horror movie personalities in the country. The show was hosted by Mr. X--Tom "Doc" Dougall--a classically trained actor who taught English at the Detroit Institute of Technology and moonlighted as a vampire on Friday nights. Unlike later horror movie hosts who would spoof their roles or riff on the movies they showed, Dougall was grimly serious and set a solemn tone for what was to follow. What most people don't know about Professor Dougall is that he co-wrote several Lone Ranger and Green Hornet scripts for WXYZ radio. The show's marquee card came up with ominous organ music and a crack of thunder in the background. 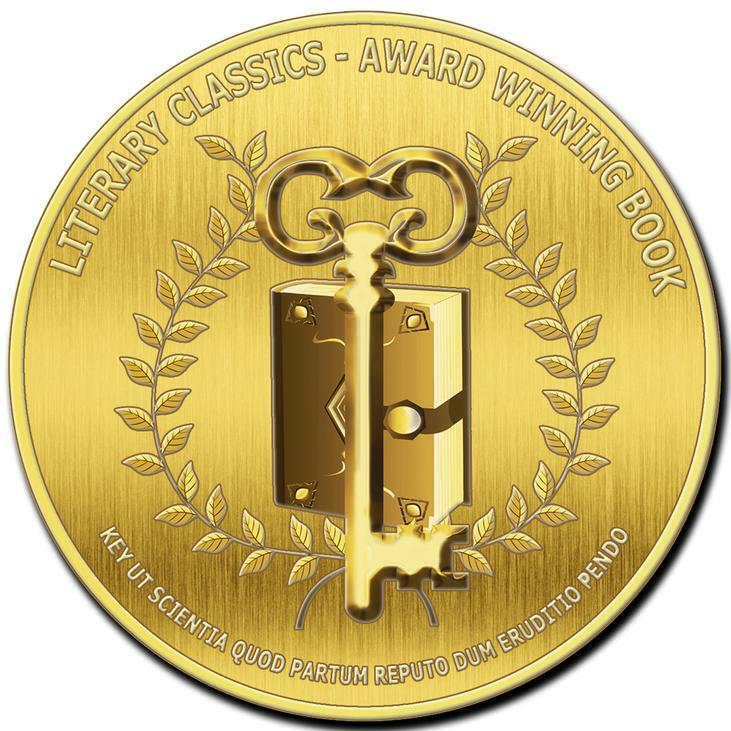 Replete in vampire grab with cape, Mr. X walked slowly on screen holding a huge open book announcing the night's feature in a scary voice. Next, he would say, "Before we release the forces of evil, insulate yourself against them." With a sense of impending doom, Dr. X continued, "Lock your doors, close your windows, and dim your lights. Prepare for Shock." The camera came in for an extreme close-up of Dr. X's face, more lightening and thunder effects, and finally his gaunt face morphed into a skull. Then the film credits would roll. There was something positively unholy about the show which made it an instant success with my generation of ghoulish Detroit Baby Boomers. The show's ominous organ music set the mood for the audience. The piece was listed only as #7 on a recording of Video Moods licensed for commercial television and not available to the public. 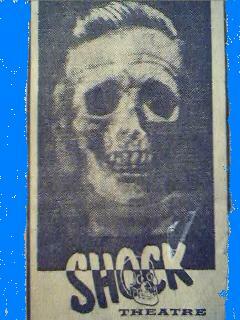 No video link to Detroit's Shock Theatre's opening has surfaced, but the above newspaper ad for the show gives an idea of the facial dissolve special effect. If anyone knows where I can find a link, Gmail me so I can add it to this post. Thanks. 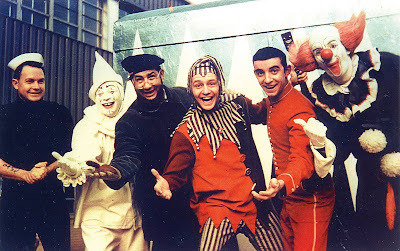 Poopdeck Paul, Milky the Clown, Captain Jolly, Jingles, Johnny Ginger, and Bozo the Clown. 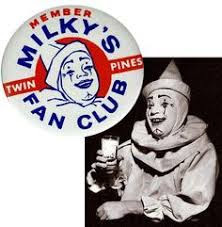 Late in 1950, Twin Pines Dairy wanted to sponsor a children's show with cartoons, western movies, and a magic clown called Milky. The dairy owner had seen magician Clare Cummings perform in the Detroit area and offered him the job. Cummings created the Milky makeup and his wife made his costume patterned after the clown in the opera Pagliacci. Milky the Clown was born. Between commercial breaks, Milky performed magic tricks and hosted the day's movie. When he performed his tricks, Milky would always say the magic words "Twin Pines." In the days of only four TV broadcasters in the Detroit area, Milky worked at all three American channels. Milky's Movie Party debuted on December 16, 1950 at WJBK-channel two. In 1955, Milky moved to WXYZ--channel seven with the same show except with Little Rascals shorts. In 1958, the show moved for the last time to WWJ--channel four with a slightly different title Milky's Party Time. Party Time included a live audience and competitions between boys and the girls. Winners would chose a prize from the Twin Pines Toy House. Milky the Clown ended for Cummings in 1964 when he gave up the costume and makeup to make more money in industry. Clare Cummings died on October 31, 1994, the same day as another noteworthy magician's death in Detroit in 1926--Harry Houdini. Cummings donated most of his magic tricks and one of his costumes to the American Museum of Magic in Marshall, Michigan. They are on permanent display. In 1957, Windsor, Ontario broadcaster CKLW--channel nine purchased 234 Max Fleisher Popeye cartoons and they were looking for someone to host Popeye and Friends for their 6:00 pm time slot. Toby David portrayed Captain Jolly. Captain's Jolly's first mate was Poopdeck Paul portrayed by Paul Schultz, who worked the weekend slot. The show was popular but ended in 1964 as CKLW decided to cancel the show. Captain Jolly would address his kiddie audience as his "Chipmates" in his best bad-German accent. Jerry Gale was working as a stand-up comedian in Toledo, Detroit, and Windsor scratching out a living. 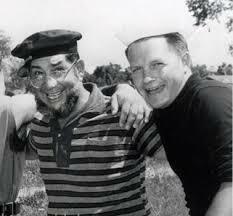 In 1957, he auditioned for a new WXYZ program showing Three Stooges shorts called Curtain Time. The station manager insisted that Gale work under the name Johnny Ginger. Ginger's character was dressed as a stagehand in bib overalls. He would open the curtain and close the curtain for every show. Curtain Time ran from 1957 until 1960 when the show was rebranded under the name The Johnny Ginger Show running from 1960 through 1968. 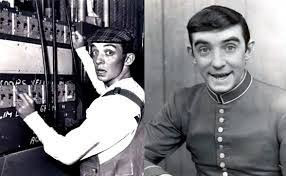 Ginger changed his costume to a bellhop uniform and became a fan favorite. Jingles in Boofland was purchased from a Fort Wayne, Indiana station by CKLW in 1958 for their weekly 5:00 pm time slot. Jerry Booth's character was a court jester and not a clown. He wore no makeup. His costume covered with bells jingled whenever he moved. Jingles lived in the mythical kingdom of Boofland--a play on Booth's last name. The show did not have a studio audience to compromise the fantasy of the medieval castle, the parapet, the archway, and several set pieces which allowed kids watching at home to work their imaginations. His two sidekicks were puppets, Herkimer Dragon and Cecil B. Rabbit. Herkimer, Jingles, and Cecil B.
Jingles played the straight man reacting to the puppets' eccentric behaviors. The rabbit was a bossy know-it-all. The dragon was a soft-spoken buffoon who did stupid things all the time. Occasional puffs of smoke would come out of Herkimer's mouth. Inside the puppet's head was a tube. Off-stage actor and voice of the puppets Larry Sand would light up a cigarette and blow smoke through the tube creating a fire-breathing dragon effect. Jingles's comedy skits and running gags were wrapped around the Warner Brothers cartoons and Laurel and Hardy shorts that the program served up. 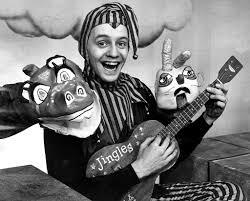 Jingles in Boofland ended in the early sixties. The original Bozo the Clown was created by Alan W. Livingston in the 1940s for a storytelling record album. The character first appeared on TV in 1949. The rights to Bozo were purchased in 1956 by Larry Harmon. Harmon franchised the character across America, so every major television market had their own Bozo the Clown showing Bozo cartoons. In 1965 when cable TV was taking hold, Harmon began to syndicate Bozo's Circus from Chicago and took the show to a national audience. Individual stations no longer needed their own Bozos, nor could they compete with the new format. In 1978, the show was bouncing off satellites and appearing worldwide. Bob McNea was Detroit's first Bozo for WWJ from 1959-1967. Jerry Booth took over the role for CKLW but lasted only a month. Booth did not like putting on the heavy stage makeup or the anonymity of being Bozo. Art Cervi took over the role. 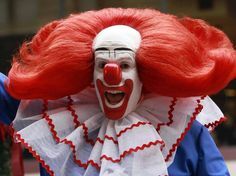 He donned the red wig and clown suit from 1967 through 1979 when his contract ran out. The above photo of Bozo needs some context. Bozo was doing a live appearance in Tiger Stadium. His makeup and wig are exaggerated so the crowd could see him from a distance. "Whoa, Nelly!" Normally, he wasn't that scary. No survey of Detroit's kid show hosts would be complete without mention of the King of Detroit Kiddie Comedy--Soupy Sales. His show Lunch with Soupy ran at noon on WXYZ from 1953 until 1960. I remember Lunchtime as a half-hour romp of slapstick, word play, and improvisation. Soupy's signature trademarks were the "pie in the face" and his dance the "Soupy Shuffle." No cartoons, just Soupy and his puppets White Fang, Black Tooth, and Pookie.